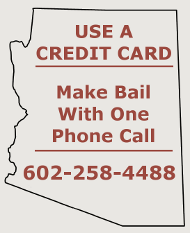 Maricopa County Bail Bonds has posted some of the largest bonds in the state. Large bonds, $50,000 and greater, frequently require coordinating the resources of more than one party. Client emotions are commonly strained and only bail agents who have the skills of diplomacy and are capable of smoothing a building crisis can keep these deals together. Knowledge of real estate and collateral are paramount in closing transactions quickly. Our agents are experts at evaluating your assets and can expedite your bail bond needs. Maricopa County Bail Bonds will exceed your expectations and meet whatever challenges your bond may bring. What can I use for Collateral? Just about any salable asset can be used; however, if you have a large bond on the order of $50,000 or bigger, the old Chevy that you have parked along the fence line isn’t going to do. Most large bonds are collateralized using equity in real estate; however we have taken Picasso paintings worth hundreds of thousands of dollars, and near new Mercedes that qualify. Some clients are able to use cash or credit cards to fully monetize the bail bond. Whatever is used will be returned, once the bond has been exonerated; the only thing non-refundable are the fees. How can I use my House for Collateral? Using your home or other real estate for security on a bond is relatively easy! We will need the property address, or the Assessor’s parcel ID number and we will need a copy of your latest mortgage balance statement if the property is mortgaged. Our agents at Maricopa County Bail Bonds will attempt to establish the value of your property and the equity available. One or more properties can be combined in order to come up with enough equity value to secure the entire bond amount. Most properties in the United States can be used (Texas and New York excluded). Can I use Cash for the entire Bail Amount? Securing the entire bond with cash or credit cards is the fastest and easiest method for any bond. We basically act as your agent to post your cash with the Court. The Court holds the funds until the case is over or the bond is exonerated, which ever comes first. We ensure that the funds are returned to you when the Court releases the bond.